Two delicious dishes to help us stay warm and cozy throughout the long, cold winter months. We grew up eating this lentil soup almost every day each week, as it was my mom’s favorite soup to make. This dish is simple yet flavorful—just like everything else she creates. Split pigeon peas are my mom’s go-to for this recipe, but they are usually not available in your regular grocery stores. I did not get a chance to make a special trip to the Indian grocery store when making this, so I used French split lentils (orange lentils), and it was just as perfect for that warm afternoon. >> In a 3-quart sauce pot over medium heat, bring 3 cups water to a boil. >> Once the water has come to a boil, add lentils and stir once. >> Bring to a boil. Remove any scum that has formed with a skimmer or slotted spoon. >> Reduce heat to low and partially place the cover on the pot. Cook for 25 minutes. >> Using a whisk, mix the cooked lentils until smooth, about 30 seconds. Remove lentils from heat and set aside. >> In a small frying pan over medium heat, melt ghee and add hing (if using). >> Add black mustard seeds and allow crackling of the seeds. >> Once the crackling has somewhat stopped, add cumin seeds, red chilies, curry leaves, and jalapeno. Saute for one minute. >> Add turmeric and tomato, then mix. Cook for 10 minutes. Stir once every two minutes. >> Add sea salt and jaggery. Stir to combine. >> Add the sea salt and jaggery mixture to the lentils and bring the lentils back to a boil. Adjust salt to taste, if necessary. >> Add cilantro and mix. Lentils are ready to be served and enjoyed! Note: Curry leaves are optional, but they do impart a fresh lemony flavor. If you cannot find curry leaves, leave it out altogether, as there is no substitute. If the lentils are runnier than what you like, boil them for 15 minutes uncovered. If the lentils are thicker than what you like, add half a cup of water to adjust consistency. Pulao is the Hindi name for pilaf—which is rice cooked with spices, or sometimes in stock. 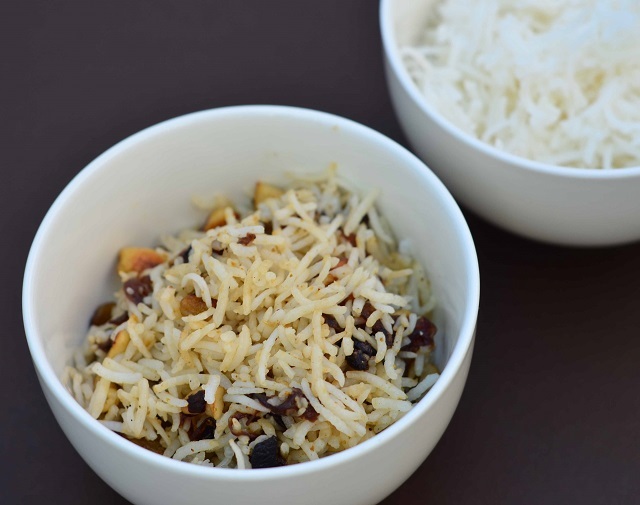 My mom always made this rice dish when guests were over, as adding nuts and exotic spices was one way to impress them with her culinary talents. Based on your Ayurveda dosha, it is advised to consume nuts during winter. Warm spices and nuts help our immune systems with fighting colds and other illnesses. This recipe can be enjoyed by itself, or with lentils or curry. >> In a pasta pot, boil 10 cups of water. Add 2 teaspoons salt. >> Once the water comes to a boil, add basmati rice, and cook for 10 minutes. >> Strain, using a colander, and set aside. >> In a 4-quart, wide-bottom sauté pan, melt ghee over medium heat. >> Add onions, cloves, cinnamon, cardamom, and bay leaves. Mix. Cook for 10 minutes, stirring every minute. >> Add nuts and raisins, and sauté for 3 minutes, stirring every minute. >> Add cooked rice to the pan, along with ground Garam masala. Gently toss. >> Reduce heat to simmer, and cook covered for a couple of minutes. 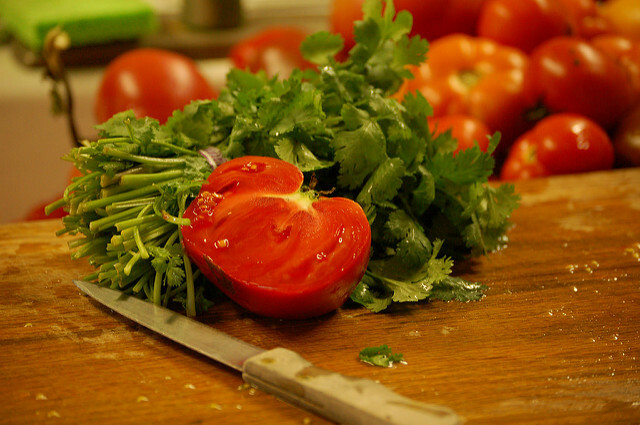 >> Garnish with cilantro and this pulao is ready to be served. I just made the pulao and it was delicious! While the onions were cooking in the spices my house smelled amaaazing! Rupen Rao is an Indian cuisine culinarian residing in Washington, D.C. He was born in Mumbai, India and devotes all his learning about Indian food to this sole inspiration, his mom. 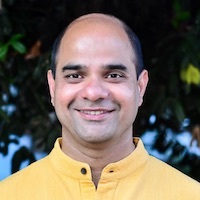 He is an instructor specializing in Indian cooking, and he is an author of three Indian cookbooks, with Ayurveda Cookbook being his latest offering. He also has a line of spice blends that are available in select stores in the Washington, D.C. area and online on his website. Rupen simplifies Indian cooking so it is accessible to all. The myths about Indian cooking—that it involves long lists of ingredients and a preparation process that is tedious and lengthy—are proven untrue by Rupen in his teachings and his writings. Rupen’s recipes are simple, easy, and many of them can be cooked with ingredients that are readily available in grocery stores.